Call it a pouf, an ottoman, stool, a "that thing over there", or whatever you want - these multifunctional pieces are an absolute necessity for any home if you ask me. Poufs are great for kids, for entertaining, for using as a side table or a stool and the list goes on. In terms of bang for your buck, poufs are great pieces that you can get a ton of use out of. They're stylish, easy to store and usually affordable or even DIY-able! As I spent some time yesterday searching for the perfect pouf for our bedroom I realized my love for these little home accents runs deep so why not share 10 perfect poufs I love that I think you will too?! 1. No list of poufs would be complete without a moroccan leather pouf. These pieces work well in a wide style of spaces and the leather adds a warmth to any room. 2. This luxe tufted ottoman adds a richness with it's deep hue and velvet fabric. I love a tufted piece for adding a feeling of luxury to a room as well as adding visual interest with its texture. 3. This beachy boho pouf is great for lounging. Prop a few beside your fireplace in your living room, or place one in your bedroom for a glam boho feel. 4. A piece like this charcoal leather pouf is so great for use as a side table or a stool. Tiny, easy to tuck away and stylish, it's a great piece! 6. Modern but cozy, I love this charcoal and cream striped ottoman for cozy lounging. 7. 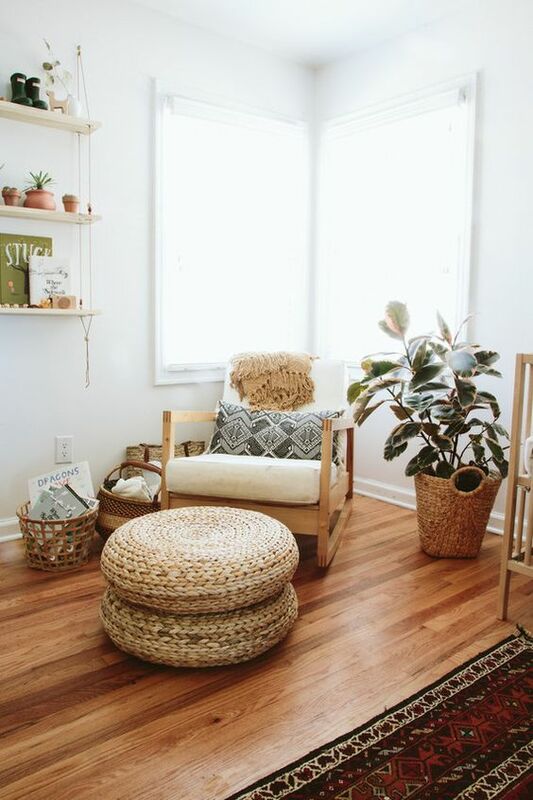 Jute is a fabulous material to pick when trying to find pieces that will add a natural touch to your space and work well in a variety of decor styles and this jute ottoman is no exception. 8. A little bit eclectic, a little bit boho and a whole lot of stylish, I love this patterned ottoman! This is very close to the piece I've picked for my own room so you'll have to stay tuned! 9. I adore this green velvet pouf with a brass accent. How luxurious is this piece?! Green velvet - gorgeous, brass trim - so on trend and it's the perfect sized piece to be practical and functional while not taking up a ton of space. Talk about win, win, win! 10. It was love at first sight with this eclectic green ottoman. As trends dictate that we'll be seeing a ton of green in interiors this year I just had to include this stunner in my round up.